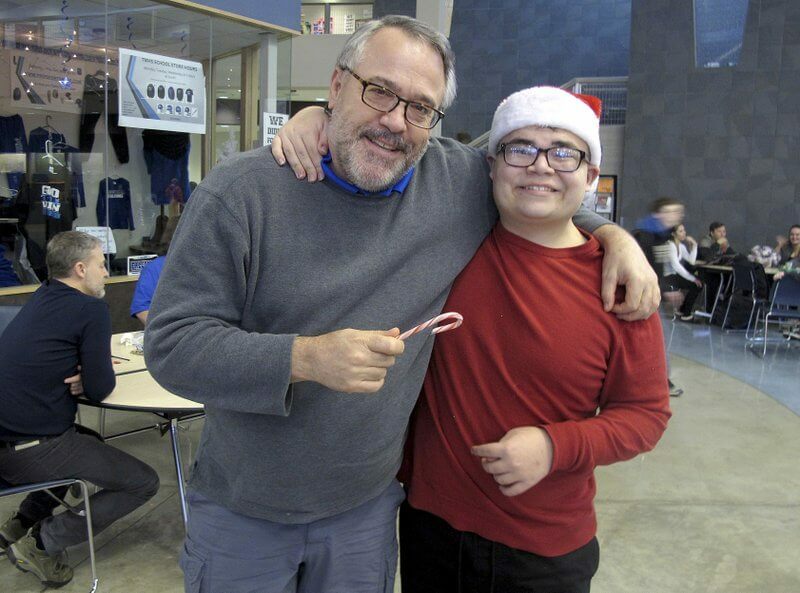 In this Dec. 20, 2016 photo, Thunder Mountain High School Principal Dan Larson, left, poses for photos with Mitchell Henderson, one of the students from Juneau-Douglas High School that spent a lunch hour handing out candy canes to students at Thunder Mountain High School in Juneau, Alaska. Students passed out candy canes as part of a kindness campaign spearheaded by the Juneau Police Department that officially kicks off with the New Year. (AP Photo/Becky Bohrer)ANCHORAGE, Alaska (AP) — Following a year of deadly confrontations between police and citizens across the U.S., police in Alaska’s capital city are spearheading a campaign to turn 2017 into a community-wide year of kindness. ANCHORAGE, Alaska (AP) — Following a year of deadly confrontations between police and citizens across the U.S., police in Alaska’s capital city are spearheading a campaign to turn 2017 into a community-wide year of kindness. Juneau police will kick off the campaign with public potlucks on New Year’s Eve and New Year’s Day to encourage locals to commit daily acts of kindness and to reach out weekly to individuals outside their usual circles. Groups, businesses, government agencies and others also are choosing a different week of the year for their employees to conduct “kindness surges,” with correctional officers at the local prison taking the first week. Ideas being considered include visiting local senior homes, distributing care packages and paying for a stranger’s meal. The goal is to measure the impact of kindness on such areas as crimes, suicides and emergency calls at the end of 2017, according to Lt. Kris Sell, who hatched the idea in a partnership with the global kindness advocate, Random Acts, and others. “Can you change the quality of life in a community and prove that you have done so?” Sell said. Jennifer Willis-Rivera, development manager for the nonprofit Random Acts, knows of no similar endeavors by a police department or city anywhere. She plans to visit Juneau in January and again a year after that. To her, the excitement will come in seeing the results after an entire year focused on kindness. “It’s something that everybody talks about all the time, but usually we’re really only focused on it around the holidays, when there’s a tragedy,” she said. Sell said the idea emerged several months ago as she contemplated what direction Juneau police could take in 2017. She said some “really hateful things” had just happened nationally, including the ambush killings of five law enforcement officers in Dallas who had been working to keep the peace at a protest over the fatal police shootings of black men in Minnesota and Louisiana. Juneau has had its own share of violence, including the nonfatal shooting of a man Dec. 3, months after police first announced plans for the kindness project. No charges have been filed. Police have released few details, saying the shooting is under investigation. That was the first police-involved shooting since August 2007, when police fatally shot a sword-wielding man. Juneau police also shot at a fleeing suspect’s vehicle in 2008, but nobody was hit. Some locals, including students, already are exercising their kindness muscles. Last week, special education students from Juneau-Douglas High School traveled across town to hand out candy canes at Thunder Mountain High School. A 17-year-old Thunder Mountain senior died in September after accidentally shooting himself. Special education teacher Janette Gagnon said students wanted to offer some cross-town support. Thunder Mountain principal Dan Larson got one of the candy canes from student Mitchell Henderson, who wore a festive Santa hat. Larson said it’s been a tough year for the school. “We need this,” he said of the holiday cheer spread by the visiting students. “This is a good time of year for goosebumps,” he said. At the Lemon Creek Correctional Center, corrections officers are planning individual projects to carry out during kindness surge the first week of the new year. One officer plans to make care bags with snacks, bus tokens and other items to pass around town. Ernestine Hayes, a Juneau-based Tlingit author, said she hadn’t heard of the kindness campaign, but praised Juneau police for the effort. Hayes, who was recently named as the 2017 state writer laureate, said once she hears more about the campaign, she might see some opportunity to formally participate.